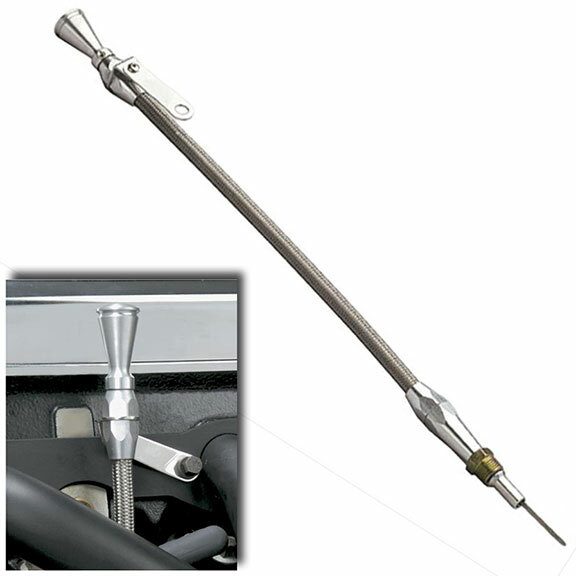 We now offer a Braided Stainless Steel Flexible Dipstick for your Factory Screw-In Oil Pan! This dip stick fits 289 or 302 engines using the screw-in style tube. It will also fit our aftermarket 302 oil pan. This is a great option if you have headers and need to relocate the dipstick mount in order to properly clear the headers. This is a high quality dipstick and tube and includes etched fill markings. Fits 1966 to 1977 Ford Broncos with 289 or 302 engine and factory or TBP aftermarket screw-in oil pans.